Marjoram is a cold-sensitive perennial herb or undershrub with sweet pine and citrus flavors. 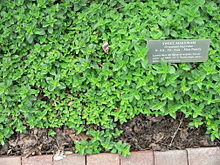 It is also called sweet marjoram or knotted marjoram. Marjoram's aromatic leaves are used either green or dry for culinary purposes; the tops are cut as the plants begin to flower and are dried slowly in the shade. It is often used in herb combinations such as Herbes de Provence and Za'atar. Marjoram is very similar to oregano, a herb from the same family. Oregano is stronger in flavour, marjoram is sweeter and milder. If a recipe requires marjoram, you may substitute oregano for it, but only use ⅔ as much as the recipe states. This page was last edited on 26 April 2007, at 15:50.